One of the biggest headaches of running an ecommerce business is getting data from the online store to your company’s accounting package. As things grow and your company starts using a CRM and/or ERP system, moving data to and from those systems becomes another headache. Up to this point ProductCart users have been able to leverage our shopping cart’s integration with Quickbooks – which was developed in-house – and an integration with Peachtree accounting through CartSpan. And what about the many other accounting packages? And CRM systems? 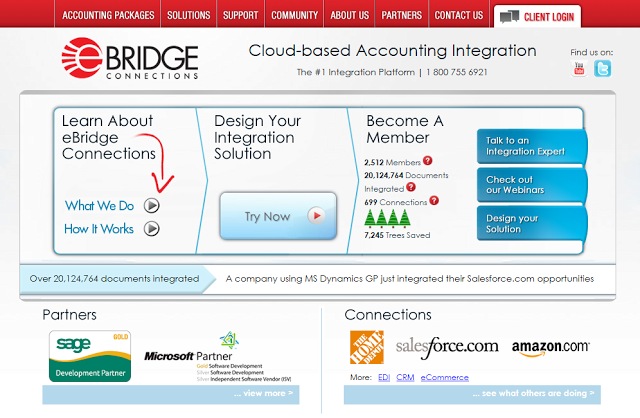 The Connector offers two-way integration with over 40 popular accounting packages. It supports more than 40 accounting packages including Microsoft Dynamics GP, AX, SL, NAV & RMS, Sage MAS 90/200/500, Sage ERP 100, Peachtree, QuickBooks, SAP, Accpac, Epicor, NetSuite and more. The eBridge Connections platform can also integrate ProductCart with EDI trading partners, like WalMart or Home Depot; CRM applications like Salesforce.com and eCommerce marketplaces like Amazon.com and eBay. Pricing begins at around $1,000 per year and grows depending on the services needed. To learn more and see if it could work for you, try out their solutions builder, or give them a call at 800-755-6921. If you end up trying eBridge, please share your experience with other ProductCart users in the comments below.